Let me start this off by saying I am a fervent radish hater. I want to like their candy colored gems and bushy green tops so much...but I have been scorned by many a radish. Too peppery. Too spicy. Until this batch of radishes and this recipe, that is. 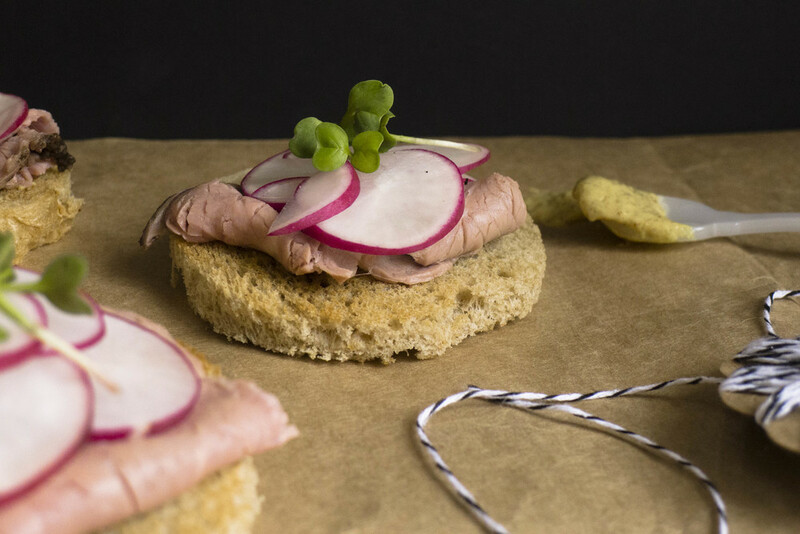 With a base of aromatic rye bread, a swatch of dijon mustard and layers of thinly sliced roast beef and radishes, this healthy hostess appetizer round is gorgeous and the perfect palate pleaser. The crisp radishes mimic a traditional horseradish addition to the roast beef, but they also add fiber. And you just can not have too much fiber in my nutrition book. Directions: Toast sliced rye bread and cut into rounds with a metal cookie cutter. Dab a small spoonful of dijon mustard onto the bread and fold sliced roast beef onto the round. Top with radishes and microgreens. I need to have a proud plant momma moment here. See the microgreens? They are from the same radish seeds I planted the other week. Major money saver. Wegmans would charge me an arm and a leg. What do you think about radishes? How do you eat them?